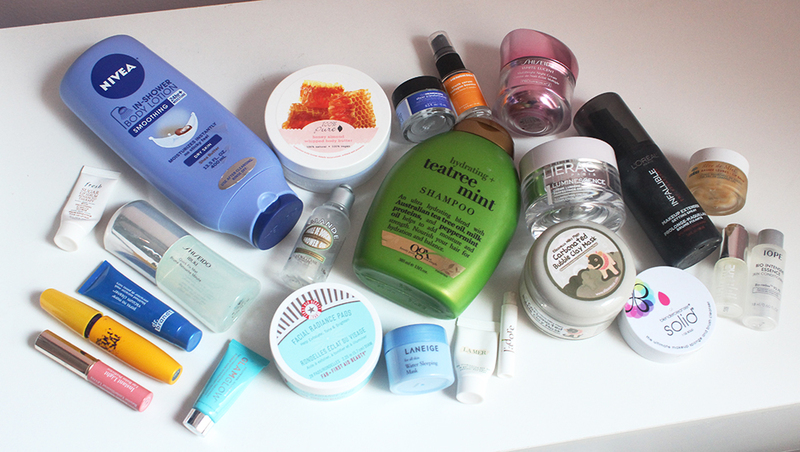 My empties from the last two months were a mix of favorites that I've repurchased several times over as well as some disappointments. Let's go through a quick rundown of the highs and lows in no particular order. The First Aid Beauty Facial Radiance Pads and Beauty Blender Cleanser Solid are in the love category and I've purchased both of them many times. I also really enjoy the Ole Henriksen Sheer Transformation moisturizer and have a couple of jars of that in various sample and gift with purchase sizes. The IOPE Bio Essence is something I love having in my skincare routine and I'm currently using the full size. The Glam Glow Thirsty Mud Hydrating Treatment was a surprise favorite - it smells delicious and it really plumps up the skin. I think it would be perfect for long flights. I am a huge fan of the Clarins Instant Light Lip Balm Perfector and finished the one in 01 Rose. These are really emollient sheer tinted lip balms so it's easy to finish it up. I don't often like perfumes but I Dior J'adore is one I always look forward to having a sample of. Now for the disappointments.... Everyone but me seems to love the Nuxe Reve De Miel Lipbalm. It's a waxy balm that goes on the lips quite matte and doesn't seem to deeply hydrate them. It didn't give me a bad reaction or anything but I just don't get the hype. The Shiseido Ibuki Quick Fix Mist* had a strange watery gel consistency and the spritzer wasn't fine enough. Every time I used this I had globs of moisture on my face which did nothing for me. The Lierac Luminescence Illuminating Cream Complexion Perfector is supposed to be a brightening moisturizer but it was very unpleasant to use on the face. I ended up throwing most of this out because I've had it for close to two years. The moisturizer is heavy, thick and loaded with shimmer. I love the Fresh Sugar Lip Balms so I was excited to try the Fresh Sugar Lip Serum Advanced Therapy but it really fell flat - it was way too thin and not moisturizing enough in the slightest. It felt like I was putting face serum on my lips and I would often end up eating it (and it didn't taste good). The 100% Pure Honey Almond Whipped Body Butter was only a disappointment because the tub was smaller than I expected for the price. I'd recommend The Body Shop's body butters over these as they're less expensive and the scent lingers for longer. It's always good to finish up products and bid farewell to the things that didn't quite work out. At the same time it's interesting to see what products I purchase over and over again and use up fully. I've been picking out products I want to get rid of from my collection so expect a decluttering post before the year is over!